1) Ocotillo is pronounced oh-ko-TEE-oh, not ah-ko-TEE-oh. 2) The plant is frequently described in print as a cactus, it is not . 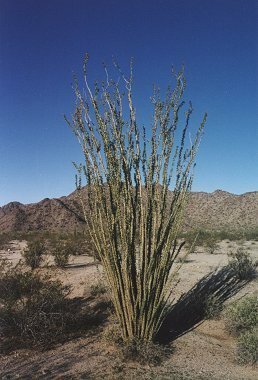 Ocotillo is a woody shrub which grows from 10 to 20 feet tall. It consists of long, thin, mostly un-branched, spiny stems that grow from a central location at the base of the plant. It grows in a wide variety of desert habitats below 5000 feet in elevation. The ocotillo is drought deciduous, which means it loses its leaves in dry periods, growing them back in response to recent rains (usually within 2-3 days of a recent storm). This process may occur several times during the course of the year. Leaves, when they are present, are small, oval and green and grow to 2 inches in length. 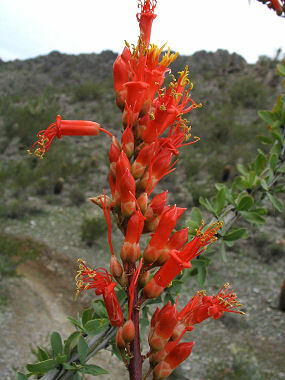 Mature Ocotillos may have up to 75 branches. The plant blooms between March and June and forms clusters of red, tubular flowers (which are about 1 inch in length) at the tips of the canes. The color and shape of the flowers suggest pollination by hummingbirds. While Ocotillo nectar is an important energy source for migrating hummingbirds, which in turn, provide some aid in pollination of the plant, studies have shown that bees are probably a more important source of pollen transfer for the plant.